We attempted to wake up at 6 this morning, only to fall back to sleep for another hour because we were so tired from our long day yesterday. The entire hike today was relatively flat, with only small elevation changes. We welcomed the lack of ups and downs as a little break. But what the trail in Pennsylvania lacks in climbs, it makes up for in rocks. Today was the first day we experienced varying degrees of rocky trail conditions all day. The first few miles were very smooth, but after that we hiked through a few rock fields with larger rocks to areas scattered with small rocks. When your feet hurt, the rocks aren’t always fun. I was moving down the smooth stretch this morning and almost stepped on a small rabbit sitting in the trail. I was about one step away, but it remained still. I snapped a photo and stood there for a few more moments. I wondered if I should wait until Miles caught up to me to make sure he didn’t step on it. It blended in well with the trail. As I took a step back, it suddenly hopped away and my fear was quelled. We stopped by the 501 Shelter only four miles in to check out the place. It’s too bad we couldn’t have stayed there since it was a fully enclosed building with bunks, water spigot, and pizza delivery. But you know what the best part of the 501 Shelter was? It had a shelter cat! I absolutely love cats and this cat was very affectionate, so I was in cat lover’s heaven. It took all the attention it could get from us. We even removed a tick from its ear with our tick nipper and gave it fresh food and water. Needless to say, I was torn when I had to leave the shelter after we took a much longer break than expected. 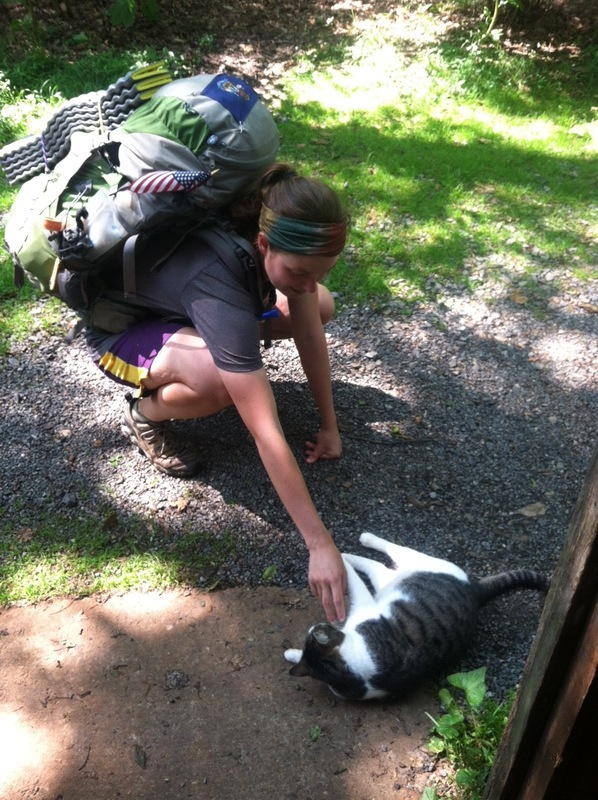 As we headed up the blue-blazed trail back to the AT, the cat began to follow us. Right then and there, I wanted to scoop it up and take it with us back to Maine. 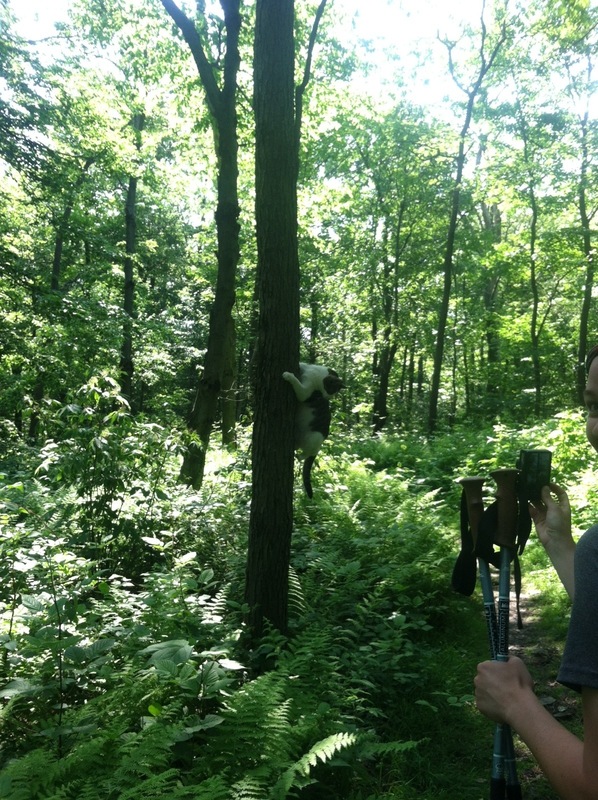 I decided to shoot a little video of the cat and as I was shooting, it suddenly leapt onto a nearby tree, clawed its way up a couple of feet, and then jumped back to the ground. What a shelter cat! It acted like it was nothing and then proceeded to creep into the woods to hunt mice. We only had a couple of views today of the surrounding farm country; the rest of the day was spent hiking in the cicada-filled forests. 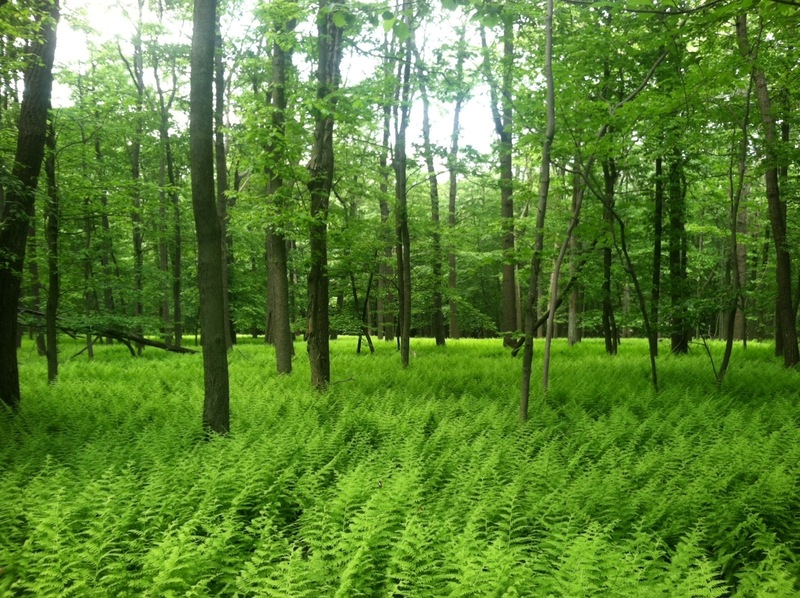 In some areas, the forest floor was covered in bright green ferns, the sun shining through the canopy of trees. As we took a break in the morning, we overheard a couple talking as they hiked by us, commenting on, “crazy, long-distance hikers.” They didn’t mean it in a bad way, just the fact that they couldn’t fathom hiking so far in one trip. Are we crazy, long-distance hikers now that we’ve hiked over 1200 miles?! No. Not until we hit 2,000 miles. Not long after our break, we’re hiking along on the trail, when all of a sudden I trip on a tiny tree stump. It was more like a tree nub that was really hard to see. I get tripped up a few times a day normally, but 95% of the time, I catch myself before falling. Today’s fall fell into the other 5% when I come crashing down, my pack’s gravitational force pulling me down even faster. I gave a yelp and scraped up the same spot on my left leg that I had hurt only days ago. I stubbed my toe on the nub, which hurt more than the bleeding skid marks on my leg. Thankfully, this time Miles was there to help me up. Scraping an already scraped up scrape is not fun. But, I figured I’d just let the blood dry and deal with it later. It began to sting as my sweat crawled into the open wounds. Enough about the newfound fact that I’ve become a clumsy hiker. I’m blaming it on the rocks. And the tree nubs. My feet were hurting near the end of the day again, but at least we were hiking less than 20 miles today. When we arrived at the trailhead of the shelter, a father and daughter were handing out orange slices and snacks to thru-hikers coming through. 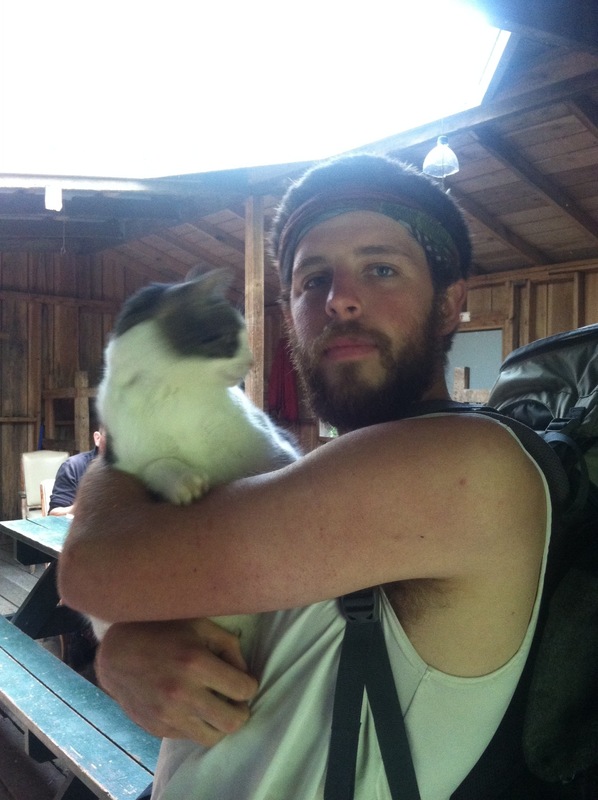 It was almost 6 by the time we arrived and we were only the third thru-hikers they had seen since 3:30. It was a nice end to the day and we were glad to be offered food since we came out of Duncannon with less food than we should have had. After we set up camp, they gave us more of the food to eat with dinner and offered to take our trash with them tomorrow since they only had a few miles to hike back to their car in the morning. I knew that trail magic would become more sparse as we headed north, so this was a nice surprise to end the day. The 100 mile markers certainly don’t get old. We have hiked over 1,200 miles and have less than 1,000 miles to go!!! As Ferris Bueller once said, “Life moves pretty fast. If you don’t stop and look around once in awhile, you could miss it.” Indeed. Ferris knows all. Really enjoy reading of your AT adventures. Awesome of you to document so well. Enjoy and be save. 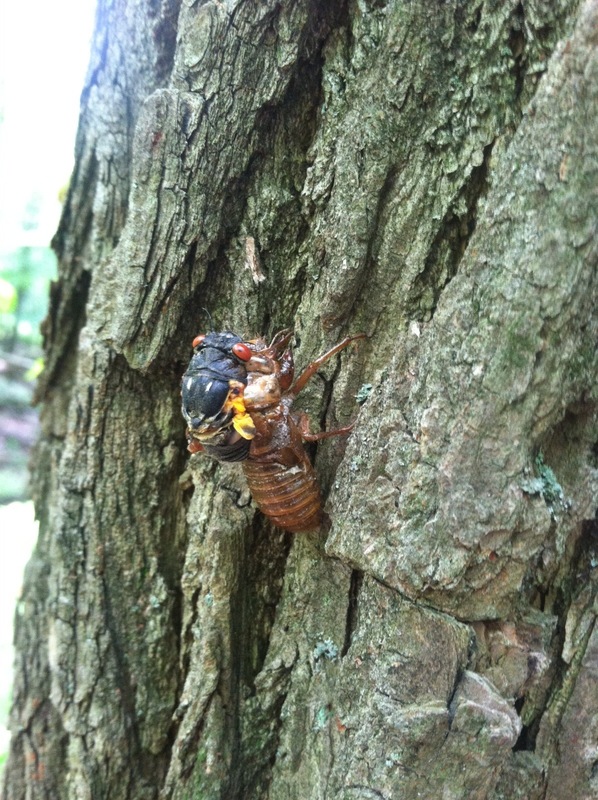 is that a cicada? yikes! Hey! My dad and I really enjoyed meeting you both outside the Eagles Nest Shelter yesterday. I didn’t realized it before (maybe because you look different in your home picture…) but I’ve actually been following your blog for a while! Thanks for making our day out on the trail. Have a great trip and good luck! I look forward to reading about your exciting (and musical!) hike to Katahdin!